Species rich floodplain meadows have been created by a long history of consistent agricultural management. Before the introduction of artificial fertilizers, they were one of the most sought after of all agricultural systems. At the time of the Domesday Book, they were the most valuable of lands due to the natural fertilisation provided by silts deposited through river flooding. The high diversity of grasses and flowers made for good quality hay, essential for feeding cows, sheep and horses throughout the sparse winter months. In fact it could be argued that meadows such as these were the resource that underpinned many communities. They provided hay for stock (essential for farming, transport, food, milk), and herbs for medicines and cooking. As a result of this, they tended to be managed communally to ensure that everyone had a strip or 'dole' of hay. Strips were often marked out using stones (as in the picture) and on many meadows the strips were alternated in different years to ensure that everyone got equal shares in the good and poor areas of a meadow. 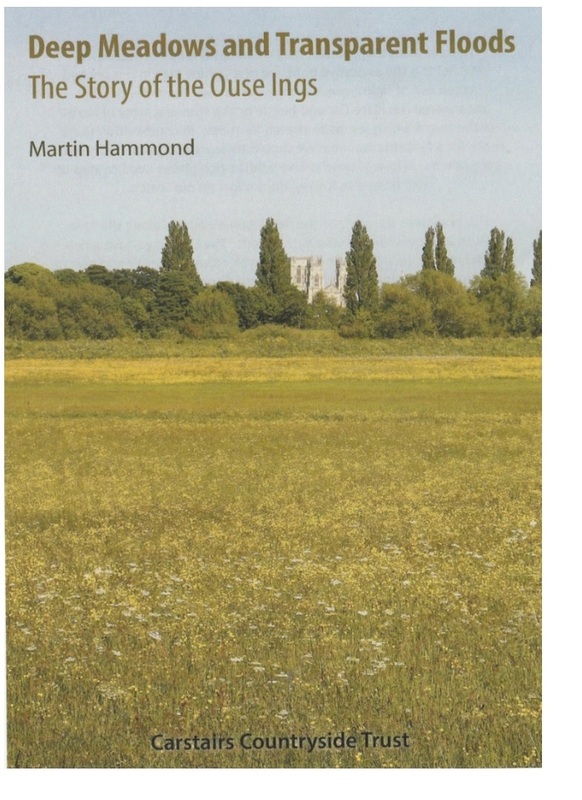 Local expert Martin Hammond tells the story of the floodplain meadows of the river Ouse as it runs through the vale of York. The Ouse Ings have a rich cultural and social history reflecting their economic value and wildlife importance. Read more about the friends of Rawcliffe meadows and to order a copy of the book please click on the link below. Due to the natural productivity of these meadows, once the hay was cut, the grass would continue to grow, so ‘aftermath grazing’ could also provide a good source of food for stock in the lead up to winter. This grazing was also communal with everyone being allowed to put their stock out to graze until conditions became too wet. These commons are a relic of the open field system and many avoided being cut into lots following the Enclosure Acts because of their importance to the parish as a whole. This pattern of management is referred to as the Lammas system, because grazing animals would not be allowed on the meadows until after Lammas Day (now the 1st August). This pattern of management and communal grazing had a number of knock-on impacts. It increased the numbers of wildflowers and grasses as meadow strips would have been cut at slightly different times throughout the summer, allowing a diversity of species to flourish in different years. Additionally, because it was not possible to sell these sites for development or sand and gravel quarrying due to the complicated land ownership and grazing arrangements, some meadows were protected from damage. Many meadows have typically been managed in this traditional way (often by several generations of the same family) for hundreds of years. Stone or wooden markers are used to indicate hay-strip ownership, and communal grazing is still in operation on many sites. This historical dependency means that these meadows are completely embedded within our culture. Many of their plant species have a range of colloquial names and the myths and folklore surrounding them have developed over centuries. The importance of historical management to current biodiversity value means understanding the history of management on individual sites is key to understanding what they are now, and how we can manage them in the future. We would like to encourage anyone with an interest in meadows or local history to look into the archives and find out more. Meadow species have often been referred to in poetry and literature. They form part of the quintessentially British landscape and have been important both economically and culturally for hundreds of years. Current changes in plant communities through lack of management although one of the biggest threats to meadows today, is not a recent observation. Even in Shakespeare’s day, a change in plant species was detected if cutting was stopped for a period of time. Click on the link below to read more about historical observations around Shakespeare’s home in Stratford-upon-Avon. There are quite a number of meadow enthusiasts who have investigated the archives to find out more about meadows near to them. In many cases this has revealed not just how old their meadows actually are (many date back to the Domesday Book and in some cases are even older than that) but also the human stories that helped to shape them. Delving into the history shows us that without a consistent pattern of management, we would not have the wildflower rich sites that we have now. If you have investigated the history of your meadow and would like to share it, or summarize it for others to see, please let us know. We would be very happy to have it on the website. Our working definition of "Floodplain Meadows," in terms of the Partnership's scope, covers water meadows. Water meadows are a particular kind of floodplain meadow in that they have more intensively managed hydrology. "Water Meadow" and "Floodplain Meadow" are colloquial terms applied to particular vegetation communities, and so there is scope for the two terms to become confused depending on whether you are describing the physical system or the biological community. For our purposes, we use these names to describe the physical systems and we use the National Vegetation Classification to label the biological communities. An information booklet is available here about water meadows produced by Historic England.